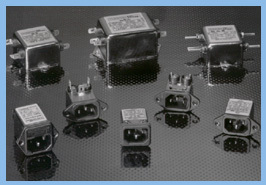 A wide array of EMI power line filters is available through High Tech Connections. These products allow today’s product engineer adaptable and flexible solutions to power design. They can effectively control electromagnetic interference in the frequency range generally used for radio communications. EMI filters, designed in compliance with international standards, have enjoyed increasing popularity with component engineers as a result of the rapid growth of personal computers and related peripherals, business machines, industrial control devices, medical instrumentation and other products utilizing digital techniques. Concurrent with this growth, problems associated with EMI, produced both within and outside of the equipment, has become more severe. High Tech Connections’ power line filters are offered as single and multi-stage chassis mount designs and as convenient, integrated power entry modules featuring a built-in IEC/EN 60320 C 14 connector.